what have I been doing? It seems like I have been chasing my tail ever since we came home from our trip to New Zealand. Maybe I am longing for the slower pace of the kiwi life?? I have just been off - then I got sick with what ever everyone else had. Lived in a drug induced state for about four weeks. Celebrated Christmas, welcomed in the New Year and now February is right around the corner. So what have I been doing? Have you ever felt like you are just chasing your tail and not getting a single thing done? I have managed to post a picture each day - except did you notice that I have problems with Wednesday's? What is up with Wednesday's? 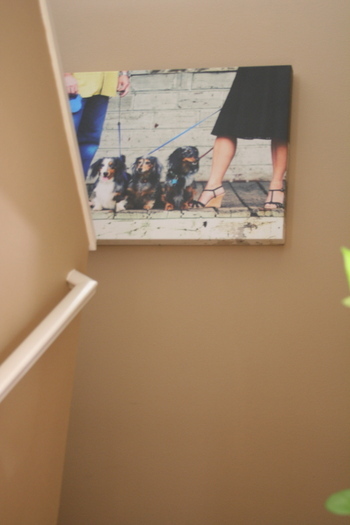 Finally hanging my canvas in the stairway. 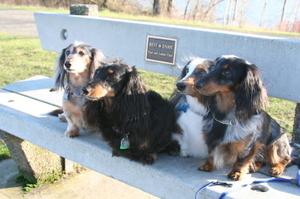 It definitely cheers up that area - walking up and down the stairs and each time seeing my happy furbabies! And since I had all of my hanging picture tools and supplies out why not tackle the art work of Eli Halpin that we have had for three years! I love Eli's style - She used to live in Portland but moved to Maryland (? ), not sure. She has a website here. 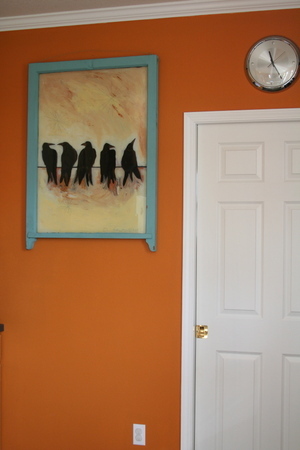 The five crows was done on an old window sash - this is now hanging in my kitchen. Yes, my kitchen/dining room/great room is ORANGE. It has been this color for 5 years, my favorite in the entire house and it's the one color that I haven't grown tired of. The nutritionist is coming to the house tomorrow. We are going to have a chance to discuss my assessment and she is going to go through the kitchen. I am a little freaked out but I also want her to see the 'real' us and tell me what I need to work on changing. So far I have felt better in the last 5 days just changing some small things in my diet. I am also back at yoga - boy have I missed that. I am getting it all together it's back on the airplane I go! I actually love to travel, but I also like to be home doing home/routine things. My travel schedule over the next couple of months looks pretty scary but at the same time all new adventures! I plan on taking my iPod that has my yoga on it and also take all my running gear - even though it takes up too much room and I may have to check my bag. I just don't want to fall off what I have started. The nutritionist has given me a lot of ideas of what to eat on the road and what to take with me. I am feeling pretty confident - I will be sure to give an update after the house visit.